All I could think about on Tuesday night is whether Kate was able to use the bathroom at her Uncle Nicky’s house. I mean, I’ve been pregnant. The struggle is real! These are the things that keep me up at night! Trivial tidbits and massive plot culminations, like the one on Tuesday night! 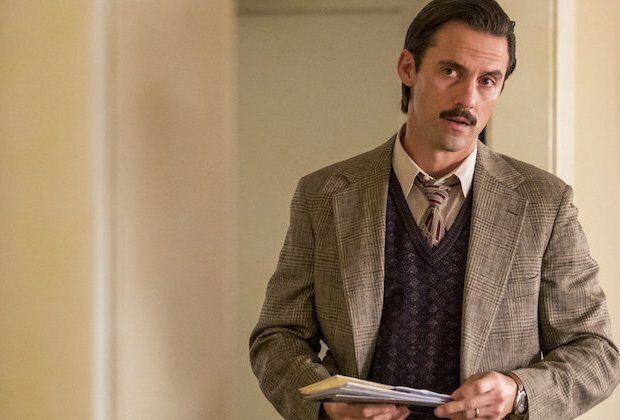 Also: We are starting to be led to believe that Jack Pearson was not completely, utterly flawless. I think it’s all good. The more human the writers make him, the more fully we know and love him. Cracks are where the light gets in, after all. And Jack has so much light. Around 1992 or so, Jack is shown receiving postcards from Nick, postcards with ever more urgent messages. “Abandoning hope,” was one. “Just 5 minutes” was another. I felt sorry for Nicky, and really didn’t get why Jack was ignoring the cards after being so wholly devoted to his brother he had followed him into war … I got it a bit later, of course, but still. I absolutely did not love that Jack was lying to Rebecca about the existence of his brother, Nicky. (But again, it humanized him so I guess that was the point.) In modern day, Rebecca is obviously unsettled by the news that her perfect husband had been lying to her. Can’t blame her for that! I wish Randall could be my neighbor or my cousin or something, and then hit me up with a daily infusion of his extreme encouragement. I adored how he reframed Beth’s job interview nerves: “Those companies should be nervous to meet you.” The man should be hired immediately by Hallmark. More Delightful Randall-isms: So cute when he proudly runs down the list of healthy snacks he packed for the Pearson-Siblings-Find-Our-Dad’s-Skeletons-in-the-Single-Wide-Trailer-Road-Trip. “Nuts, and seeds, and many pitted fruits…” Many pitted fruits! Delectable, if you are a Chinchilla. I loved the way the writers overlapped Jack’s road trip to see Nicky with his children’s trek, 26 years later. Both were necessary odysseys. Good old Uncle Nicky doesn’t exactly fling open the door of his humble abode and warmly welcome the only kin he has, now does he? Jack’s kids and their newly found uncle stand around, awkwardly (because honestly, nothing says “uncomfortable” like a reunion with long lost relatives who wish you would leave already). Kevin saves the hour with a little clumsy humor: “My brother’s adopted,” he offers, rhetorically. “It’s true. That’s why he’s black. Also true.” Haha. The Big Three also refuse to leave without answers. “Yeah, you’re Jack’s kids alright,” Nicky says. So now Jack’s kids know the whole truth, but we find out Jack never did, which may be the saddest thing of all. “We’re done,” he says, ominously to his distraught brother, upon finding out that the boy died. Oh Jack, you really thought your brother killed a little kid? So painful for all. One of my favorite lines of the night was when Jack, visiting Nicky, relents a bit and shows him a picture of his family. “Randall is a different color,” Jack notes. “He is,” Nick says, without surprise (I kinda loved him for that). “He found me,” Jack says, which Nicks accepts as a fact, and which pretty much made me dissolve. Not “he’s adopted,” mind you, but “He found me.” Stunning. Jack does come clean–sort of. He admits he lied to Rebecca and that he had really gone to visit someone from the war. But he left out a crucial detail, and thus shut the door to the shadowy corners of his heart. Rebecca is not invited in, and somehow, she knows it. Yet in present day, Rebecca lays the burden on herself. “Why didn’t I ask Jack more about Vietnam?” she asks Miguel. He has an answer, of course, one that has served for years. “(Jack) was afraid the darkness in him would swallow up the light from you and the kids.” That answer won’t do anymore, not knowing what she knows now about Nicky being alive. “I used to love that explanation,” she says. But not anymore. And finally, back at Uncle Nicky’s “leaky sardine can,” Jack Pearson’s kids can’t leave well enough alone. And they shouldn’t leave it alone! Kevin takes the lead, insisting they can’t leave their uncle like that. And they go after him, wanting to help rescue this living link to their father and his told and untold story. LOVE LOVE LOVE that they bring Uncle Nicky home! But, it has to be said…Where did he sit on the way home in that small car? Just wondering. Maybe Randall moved the pitted fruits. Well, what did you guys think? This episode was up there for me–how about you? What do you think will be revealed when Rebecca and Nicky really talk? Should Rebecca be blaming herself for Jack’s secret? Was this a satisfying ending to the whole Vietnam story? I agree. This episode was right up there. The writers outdo themselves. I think the saddest part is that Jack was so done that he couldn’t let Nick explain. It’s Nicks own fault that it got to that point but wow. It would have changed so much…or would it? Wouldn’t Nick continued in his self destructive path regardless?